The most significant development that we have made is the RFI Linac Structure (patented). Its outstanding efficiency and its compact size go a long way to making ion linacs commercially viable. The optimum linac configuration for the initial stages of any high performance ion accelerator is the RFQ/RFI combination. The options are described below and the advantages of this combination are obvious. The cost of high powered linac systems is dominated by the capital and operating cost of the rf power. The Rf Power versus Proton Beam Energy for three different linac configurations are shown on this graph; namely the RFQ (alone), the RFQ/DTL combination, and the RFQ/RFI combination. An effort was made to make these comparisons realistic. All used the same rf frequency (200 MHz), all used the same acceleration gradient (3 MV/m), all have similar beam apertures and beam current limits The slope of the curve is inversely proportional to the efficiency of the acceleration process: the steeper the slope, the less the efficiency. The copper surface conductivity was set at 65% of theoretical for all structures. RFQ (only): The blue curve shows the rf power required to accelerate protons to any energy in the 0.25 MeV to 5.0 MeV range. The RFQ is reasonably efficient in the 0.5 to 1.0 MeV range with a slope of 82 kW/MeV. The slope of the curve has increased to 177 kW/MeV at 4 MeV, corresponding to a decrease in the rf efficiency of slightly more than a factor of 2. RFQ/DTL: The green curve shows the rf power required to accelerate protons in the RFQ/DTL combination. Because of the magnetic quadrupole focusing limitation of the DTL, the RFQ must extend to an energy of 2 MeV. The jog in the curve at 2 MeV reflects the fact that every DTL tank, regardless of its length, has two end plates, each of which has significant end wall losses. The slope of the DTL portion of the curve is 67.3 kW/MeV. 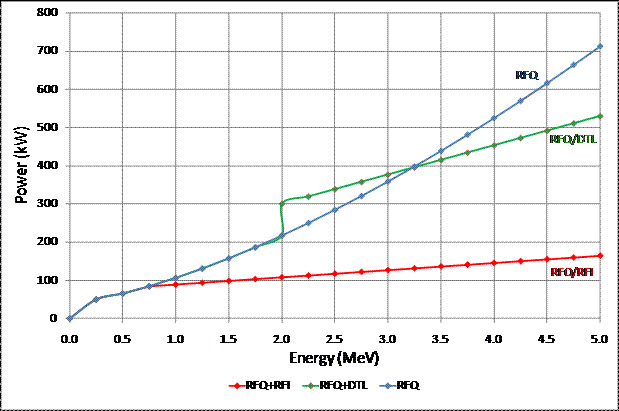 RFQ/RFI: The red curve shows the rf power required to accelerate protons in the RFQ/RFI combination. As the RFI employs rf electric quadrupole focusing, the RFQ need only extend to 0.75 MeV. Unlike the DTL, the RFI structure does not have significant end wall losses. The slope of the RFI portion of the curve is 18.9 kW/MeV (3.5 times the efficiency of the DTL). The RFQ/RFI combination is the optimum configuration for the initial stage (up to 20 MeV) for high performance ion linac accelerators.